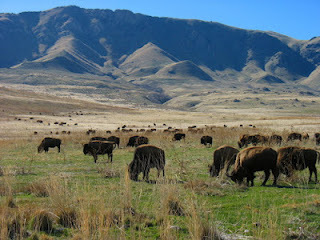 I am struck by the awesome beauty of Antelope Island. How the water reflects the grass and hills of the island and the sky melts into the same colors as the water. I would like to knit Megan something that will reflect these elements that dominate the island. I also want to knit it out of bison in honor of the unique herd on the island. Megan says she likes scarfs or other things to warm her neck. I am thinking of a lace ring, but have already done three other tubes lately so maybe a scarf. A lace scarf that has the visual elements of water, grass, mountains, and sky.